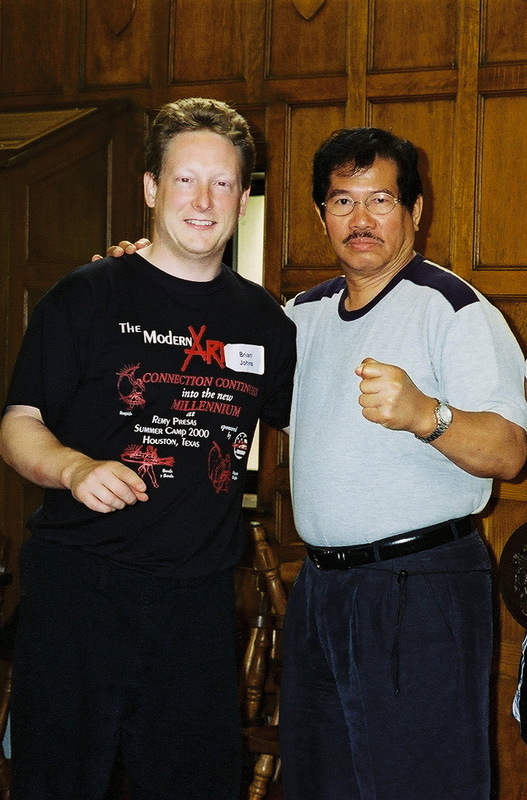 Myself and the late Founder of Modern Arnis, Professor Remy A. Presas. First and foremost, Modern Arnis is a self defence system designed by its founder and Grandmaster, Remy A. Presas. While Modern Arnis and many Filipino martial arts (hereinafter referred to as FMAs) have origins in bladed weapons usage, Professor Presas preferred not to teach the bladed aspect of the art. Over the years, his art evolved into a stick and empty hand oriented art, with much emphasis on the concept of “the flow” and “counter for counter.” Modern Arnis is not a competition oriented art, whether it be padded stick sparring, Dog Brothers type of sparring or other similar types of sparring. Very good question. Sticks should be thought of as a conceptual training tool designed to develop eye-hand coordination and hand speed. Training with sticks also enhances perceptual speed in terms of recognizing where an attack is coming from. Once you reach a comfort level training with sticks, empty hand self defence will be easier. In addition, stick movements are easily translated into empty hand movements. In addition to training with sticks, drills are prevalent in Modern Arnis and is designed to build muscle memory and perceptual speed. As Master Chuck Gauss of Detroit, Michigan has said so many times, these drills are used to build skills. They are not combative. They are designed to build skill and make your movements second nature and instinctual. Many of these drills focus on gross motor movement as those are less affected by stress than fine motor control. Modern Arnis is NOT about the current MMA fad. I love watching UFC on Spike TV and admire the athletes who participate in that kind of competition. However, the legality of the techniques employed in those competitions for self defense situations is questionable. Lastly, the underlying concept of Modern Arnis has been alluded to above; i.e., counter for counter and going with the flow. Modern Arnis is designed to teach you how to flow with opponent’s attacks using the least amount of energy and using his strengths and weaknesses against him. Training with sticks also translates well to “weapons of opportunity”: objects you may find around you if the need should arise to defend yourself.